HRMS software is a vital business tool. It’s as fundamental to the success of your business as your finance system or your CRM. That’s because, when you take on staff, there’s always a truckload of HR admin and compliance tasks that go with them. The more people you hire, the more complex and time consuming this becomes. While HR tasks are critical, many of them can and should be automated. This is where human resource management system software steps in. Enterprise human resource management software Solution provides the company a control over the employee documents and payroll calculation, better management of OT and EOS. Our HR software in Dubai,UAE contains all the essential features for an organization. Our HRMS is the most experienced human resource management software. The strength of our software has been demonstrated at hundreds of client installations in dozens of industry sectors. HRMS comes with hundreds of pre-configured reports that analyse every aspect of your employee information and will help you point out potential shortfalls in your Human Capital needs to management before they occur. Cloud based HR software Reports also allows you to organize data into intelligent reports that fit the exact needs of your business. Employees and managers can access files to update and view personal information. 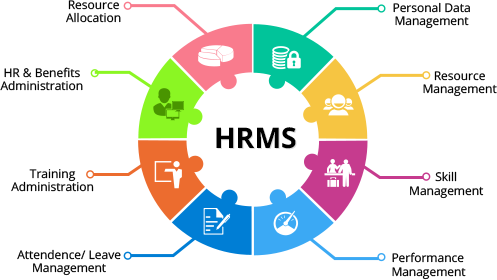 A HRMS (Human Resource Management System) is a combination of systems and processes that connect human resource management and information technology through HR software. The HRMS may help to revolutionize a workplace. A cloud-based Human Resource Management System (HRMS) helps you automate routine operational HR processes. It dramatically reduces the time you need to spend on a range of HR functions from hiring and onboarding, to managing time and attendance. As your HR system of record, HRMS software helps you follow due process, stay on top of HR tasks, and document and enforce HR policies in line with legal requirements.With automated workflows, HRMS helps you standardise working methods, streamline task responsibilities, and provide improved efficiency, HRMS software centralises employee record-keeping, and helps you keep a tighter rein on compliance. HRMS also streamlines applicant tracking and recruitment processes, and takes the pain out of payroll and benefits administration, and much more.HRMS software minimises duplication and the risk of human error. you reduce the risk of inadvertently underpaying staff, breaching award or NES conditions, or not maintaining adequate time and attendance records. Provides a centralised employee information database. Offers reporting capabilities on payroll, benefits, HR and business analysis. Eliminates the need for manual data entry and prevents mistakes such as double entries from different departments and other human errors. Provides 24/7 access anywhere, anytime if you have an internet connection. Gives employees an easy way to update their personal information and access updates on their benefits, compensation and more. Workflows HR policy enforcement and ensures due process in followed in performance management. Eliminates HR paperwork and double-handling and helps better utilise employee hours. Offers encryption, firewall monitored security and password protection. While traditional HRMS systems used to be expensive, human resource management software in the cloud offers a highly cost-effective solution for all small businesses. Plus, there’s no requirement for internal IT resources or maintenance budgets. And its simplified user centric experience is designed for easy adoption. Managing your workforce with HRMS software instead of a handful of spreadsheets delivers big wins on efficiencies and cost savings. With sophisticated reporting tools, the data from system provides valuable insights to steer your business. Our other softwares are Van sales system software, Asset tracking system software, Employee review system. HRMS software in the cloud offers an intuitive, straightforward and employee-friendly way for small business owners and managers to transform the way you do HR. HRMS system available in UAE, Abu Dhabi, Sharjah, Ajman, Al Ain, Fujairah, Dubai, Fujairah,Qatar, Oman, Saudi Arabia, Kuwait and Bahrain.